Sapa attracts tourists is not only for magnificent sceneries, beautiful landscape and friendly local people, but also authentic culinary. Thanks to diverse ethnic groups, Sapa is the home of many delicious and unique foods. Here is the list of most delicious specialties in Sapa. It is the common scene when you see local people put a small pig about less than 20 kg into a basket or in the armpits. Those pigs are call “cap nach” pigs which are one kind of special food in Sapa. They are healthy as wild animals because their foods are almost trees, corn, cassava,..In good living conditions, feeding roughly 1 year, a pig will be about 20 kg. Their meat is lean, tender, so it is the favorite ingredient for many dishes attracting foodies such as grill, fried and steaming. Sapa is home of sub-tropical vegetables, especially Chinese black mushroom. Thanks to the ideal climate, Chinese black mushroom can be found all four seasons. 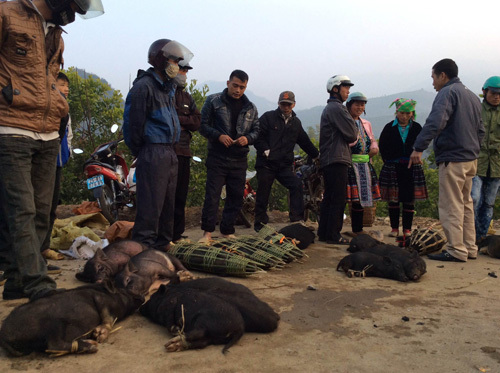 Come to fairs of Sapa, tourists will be invited to buy this special food. Tourists can enjoy Chinese black mushroom in many restaurants and small food stalls in Sapa. If it swells in water but still retains its original flavor. It can be cooked with meat, dried squid. Pau Play Day Cake is one of the most famous dishes in Sapa. The main material of the round sticky rice cake is glutinous rice which is available in this small town. The process of making day cake is not complicated. Firstly, glutinous rice is soaked in water about 2 hours and then pours it into the pot. After that, sticky rice will be put into mortar. The cake maintains the typical flavor of glutinous rice. Round sticky rice cake can be eaten with sugar. 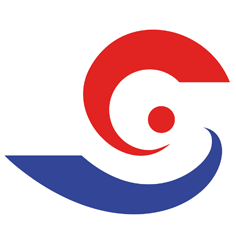 The H’Mong in Sapa is well-known for “thang co”. 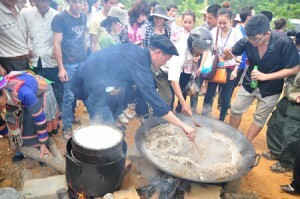 Traditionally, “thang co” is usually used for festivals or special days; however, today, “thang co” is cooked to serve all people in Sapa, especially tourists. “Thang Co” means a pot of soup which includes meat, organs of horse, vegetables and special kinds of spices. Tourists can easily enjoy “thang Co” in many restaurants and food stalls in Sapa, but the special flavors that tourists can unforgettable are made by the H’Mong. For the H’mong, “thang co” is not only a delicious dish, but also a beauty in traditional and cultural values of ethnic. Fructus crataegi wine is unique drink of H’Mong people in Sapa. Fructus crataegi so-called “love fruit”, is popular in Sapa, especially in the Hoang Lien Son range. It is the natural gift that the heaven gives to the H’Mong. Fructus crataegi starts to blossom in the end of spring (March-April). Fructus crataegi is soaked very carefully and then people use this water from fructus crataegi to make wine. Drinking wine feels like drinking carbonated soft drinks, so both male and female can drink, but not be intoxicated. From August to October, fructus crataegi is flooded in markets in fairs of Sapa, so tourists can buy it as a special gift for family and friends. 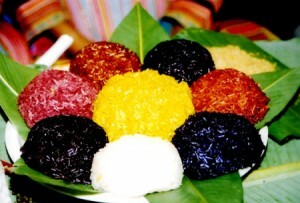 Seven color steamed glutinous rice of Nung Din people. Nung Nin people, one of ethnic groups in Sapa also contributes to exotic delicacies many tasty dishes, one of them is seven color steamed glutinous rice. This is the traditional food of Nung Nin people, often used in special festivals or specific-cultural events of the group. People often cook steamed glutinous rice having seven to present to their ancestors, their agricultural deities to wish a comfortable life, an abundant harvest. The dish attracts people by its colors which are the combination of seven colors without using any kind of chemical color. By using many kind of forest leaves and their how-knows, Nung Nin women with steady and skillful hands can make this delicious and attracting dish. The main ingredient of this food is glutinous rice which is planted in this area once time a year. Nung Nin people believe that eating seven color glutinous rice, you will be lucky all the time. This dish is not only eye-catching by the attracting and colorful appearance but also its special taste. If you had enjoyed it, I must sure that you will want to come back here to enjoy more.